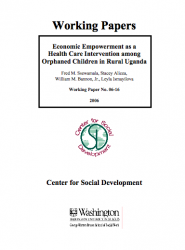 This study evaluated an economic empowerment intervention to reduce HIV risks among orphaned children in Uganda. Children (n=97) were randomly assigned to receive an economic intervention or to a control arm. Data obtained at baseline and 12-month follow-up revealed differences on HIV prevention attitudes, educational plans, and child- caregiver relationship for intervention arm children relative to control children. Findings lend support to use of economic empowerment interventions for HIV risk reduction among orphaned children.